This chapter proposes a novel framework aimed at measuring performances of smart cities. The methodological approach underlying the framework has its roots in an in-depth analysis of the smart city paradigm conducted from the perspective of urban governance. In this context, the notion of public value is seen as a backdrop for exploring the various ways in which a value for society can be created in a smart city. 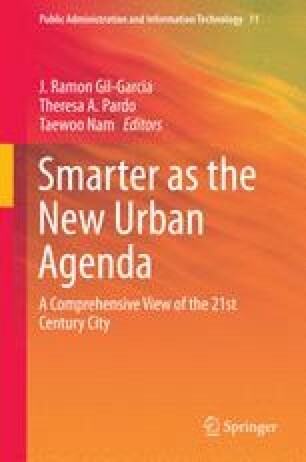 With this respect, a multidisciplinary synthesis of various strands of literature related to smart cities paves the way to the conceptualization of a framework meant to evaluate the “smartness” of a city through the lenses of economic, social, and environmental performances, in line with the “triple sustainability” principle. This vision is subsequently operationalized by means of a harmonized set of key performance indicators (KPIs) that can be grouped into two categories (called “core” and “ancillary”): whilst “core” indicators are identified with the intent to allow international comparability and to help policy makers in benchmarking their city on a global scale, and “ancillary” indicators are crafted considering the peculiarities of the city local context. Finally, the Italian city of Turin is used as a case study for testing the proposed assessment tool. Bélissent, J. (2011). The key to being a smart city is good governance: “Smart Governance”. http://blogs.forrester.com/jennifer_belissent_phd/11–05-15-the_key_to_being_a_smart_city_is_good_governance_smart_governance Accessed 11 June 2014.